Well…the challenge got off to a slow start. I’ve pretty much been sick for the last three weeks, so finishing this cake has been quite the accomplishment. The last several days have been (try to) sleep, cough, drink some coffee, cough, throw in a load of laundry, cough, drink some coffee, cough annnnnd cough some more. In between all that the monsters needed attention, if you can believe that. I guess in Indiana it’s frowned upon when you don’t feed your kids. Go figure. So the cake came together in pieces. One day I baked the cakes, another day I made the buttercream, a third day I made the filling and then put it all together. Low and slow. 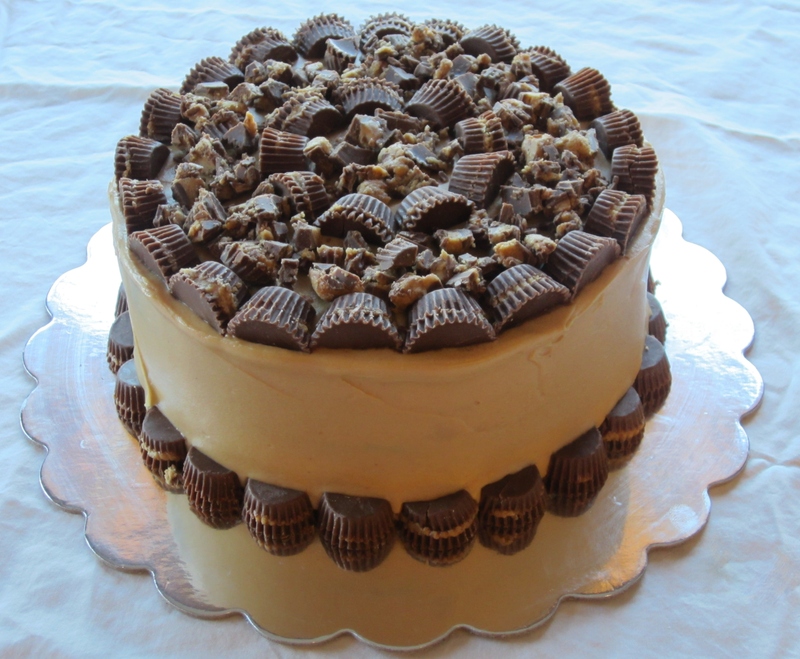 As I mentioned in my previous post I’ve wanted to combine peanut butter and chocolate for months now, and boy did I ever accomplish it with this cake. I initially found this idea on (gasp!) Pinterest, which led me to Flikr. How to describe this cake? When asked, my husband said voluptuous. I would borrow a much loved phrase from my son: Sweet mamma potato! Dark chocolate cake with a peanut butter ganache filling and iced with a peanut butter buttercream. Ultra rich and ultra decadent, this cake is definitely not for the faint of heart. I used my tried and true chocolate cake recipe, which is originally from The Cake Mix Doctor, but I found posted on Cake Central. I used Pam’s filling recipe, and the peanut buttercream is one I found on My Cake School. I’m not including the buttercream recipe here since this is a paid site, but you shouldn’t have any problem finding one. As long as it has some variation of PB, butter, powdered sugar and vanilla then you’re good to go. Preheat oven to 325°. Prepare your cake pans. (For this cake I made 2 8-inch layers. Any more than this and you should probably double the recipe. This recipe can yield 1 10-inch cake, 1 9×13 or approximately 31 cupcakes.) Combine all ingredients and blend on low for about 30 seconds to 1 minute. Stop and scrape down the sides. Increase the mixer to medium and beat 1½ to 2 minutes. The batter will be thick and should be well combined. Pour batter into pans, place on middle oven rack and bake until the cake springs back when lightly touched. The original recipe says this should take 28 to 35 minutes, but for me it’s been consistently 40 minutes. Meh…different ovens and all that jazz. Put the chocolate in a medium bowl. In a small sauce pan heat the cream until it just begins to boil. Pour it over the chocolate and whisk until the chocolate melts. Whisk in the peanut butter until it’s well combined and smooth. This makes 2½ cups of filling. Set aside ¼ of the mixture (Don’t ask me how long it took to do the math, but that’s equal to 5/8 C.) Once the rest of the chocolate mixture is cooled completely gently stir in the chopped peanut butter cups. Place one cake layer on a cake stand or plate. I piped a PB buttercream dam, but I’m not entirely sure it was necessary. Fill in with the PB fudge filling. (The filling recipe made much more than was actually needed. I don’t think I even used half of what I had.) Place your second cake layer on top. Using the reserved filling (remember that 5/8 cup? Yup…that’s the one.) spread a thin layer on the outside of the cake, a sort of ganache crumb coat. Refrigerate until the ganache is set and firm to the touch. 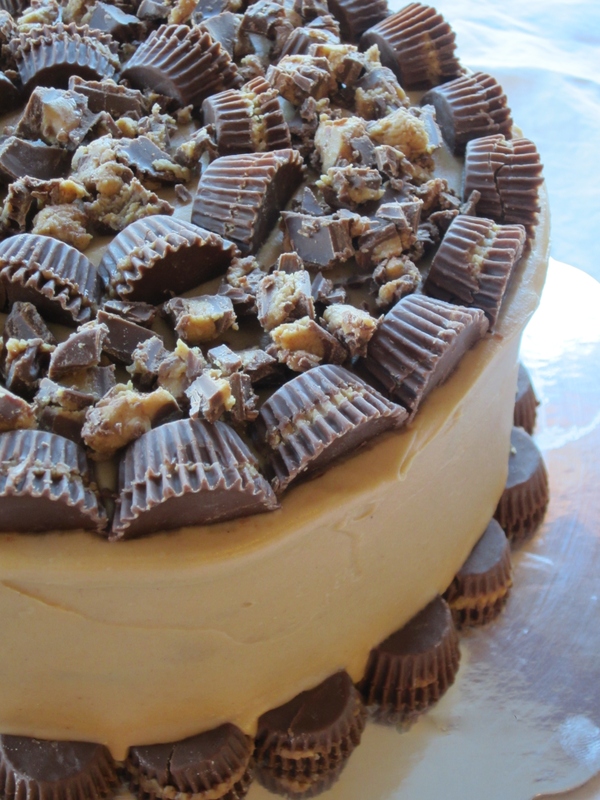 Once this has set, ice the cake with the PB buttercream of your choice and decorate with any extra peanut butter cups. I would keep this refrigerated BUT you’ll need to let it set out before serving to give the ganache time to soften otherwise you’ll have a chocolate PB mess on your plate. This is VERY rich, so a small slice will do ya. My word, I need a glass of milk just looking at it. Enjoy! looks delicious! i applaud you for putting this together while being sick. i’ve been sick for the same amount of time and all i could do i go to work (in between the hacking out a lung). Thank you! I didn’t think I could pull it together, but I’d already slacked on teacher gifts because of being sick. I didn’t want to continue the trend.